Premium Chops, Steaks, Seafood, Chicken, Pasta & Exotic Fare. 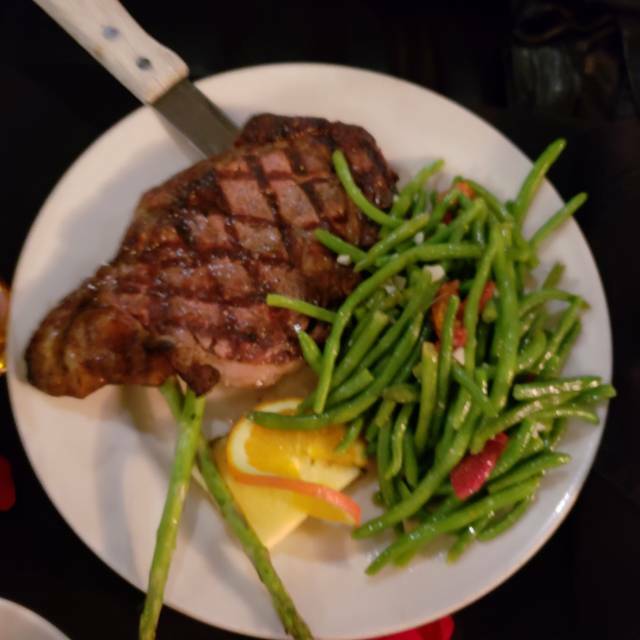 Locally known for the 14oz Prime Chops served many different ways, including Morgan's Apple-Walnut Pork Chop, Paella Chop with Blackened Prime Chop served over Spanish Paella as well as Morgan's Hand-Cut Ribeye, Filet and Strip Steaks! Guests enjoy wines and spirits in the sofa lounge and the relaxed, contemporary dining room. Dress code is business casual. Private dining available for large parties/events. The service was great, we didn't wait long to receive our food which was amazing. We went for our anniversary. 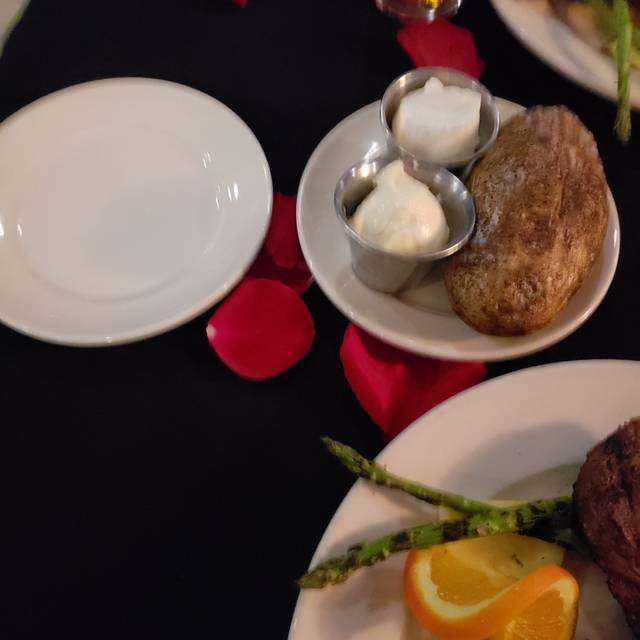 They had rose petals on the table. John, our server, was phenomenal. Helpful and very knowledgeable about the menu. Called us by name so it felt like very personal service. The food was great and atmosphere pretty quiet. We had the appetizer sampler. Bacon wrapped pork cop with baked potato and house salad. Eggplant Rolla tone with Ceasars salad and the dessert flight. Our first time going but we will go back. My husband and I received a gift card during Christmas 2017. We decided to use it. My experience was great. I made reservations in advance. When we arrived. We were escorted to our table. Paul the waiter was very attentive to our needs and he constantly checked on us to inquire if we needed anything. Even without the gift card, I would dine here. Great food, great service. Great everything! Waiter very silly. He was a good server though. Live music a little loud. Food was very good! Food was good not exceptional but pricy for what we got. We arrived a little before our appointment time. And were seated right away. Food was good. Environment was nice and inviting! Perfect place for a couple to go out eat. Meat was grisly and very rare. Service wasn’t good enough for the theme they were trying to portray. Food extremely over priced. Drinks extremely underpriced. Tables and chairs wobbly and old. People not “dressed for the occasion”. Restaurant wasn’t anywhere near crowded and we still waited almost a half hour for our drinks. This place needs a facelift plain and simple. Would not recommend. Portrays Fayetteville very well... was hoping for something different. Tommy is the best chef in SENC and John provides outstanding service! The food at this restaraunt was way overpriced. Also, the menu didn’t make sense to me . They had a kangaroo appetizer that was thrown on the menu. The steaks we ordered weren’t very good, we have had better at Golden Corral. My husband was sick the next day and we think it was because of the steak he had. I wouldn’t recommend this place to anyone. I love this restaurant! They have awesome food and service. Outstanding experience. My new favorite place. 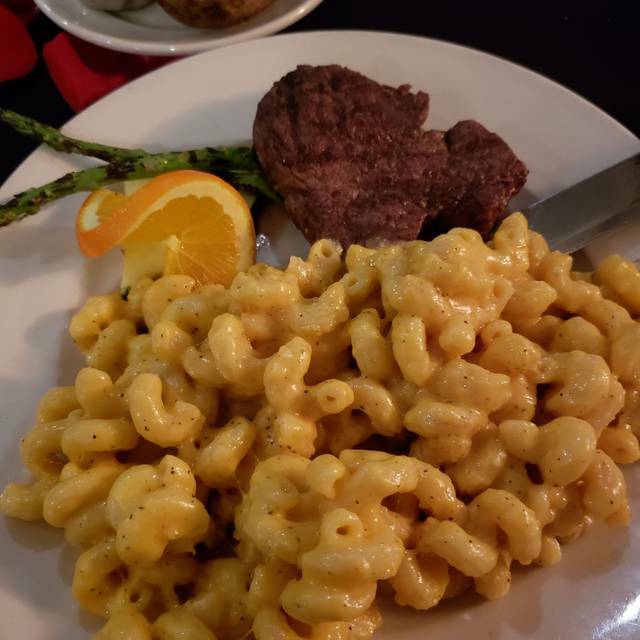 This was me and my wife's second Valentine's Day dinner here and we will be back again. The food, the customer service, and the ambiance was superb. The appetizers, wine, and dessert were good. However, the steak had a weird taste. It was cooked perfectly, but the flavor of the crust wasn’t very good. Also, there was live music on Friday night, and it was so loud that our party had trouble talking at times despite being in the back of the restaurant. Amazing food and service. Great place to celebrate our 6 year anniversary. Great ambiance. My steak was perfect! My husband’s pork chop was perfect! My mother’s salmon was just okay....it was a wonderful evening, though! I love the gray walls and decor! Service could not have been better! Went on a Friday night for my wife’s birthday and the food was spectacular. However, there was live music and the duo was terrible. Entirely too loud to the point I felt everyone was shouting just to have normal conversation. Probably will not go back on a weekend. Fantastic chops though. Food was excellent, service was fair at best. Waiter was not very attentive and the place only had 3 tables occupied at the time. At these prices I expected much better service. The staff are very friendly and the service was very good. The appetizer and salad was very tasty. The steak was nothing special. Although the meal was good, the presentation nor quality of the steak dinner was anything special. It was overpriced. Nice enough place; service was good. Food is nothing to write home about. We are locals that haven't been to Morgan's C H in a while so decided to meet another couple there last Saturday night. We enjoyed cocktails in the bar prior to our reservation time. The bartender was very friendly and filled our drink orders promptly although the bar was only about half full. The 3 piece jazz combo got started about the time we moved to our table. We shared a couple of appetizers which were quite good - spinach and artichoke dip and brie cheese with blackberry jam. Our server was very professional and knowledgeable with helpful suggestions as we decided on our meal choices. Each of us ordered different entrees and we were all pleased with the results. The food was served hot and freshly prepared. All told we had an enjoyable evening and will definitely return soon. Great service and we enjoyed the live band. Everything about our experience was amazing !!! The waiter with the orange color hair was amazing !! Atmosphere was perfect and so was the food. I will definitely be back SOON! The food wasn’t the best. It could’ve been better seasoned. Overall the place itself was great. I really enjoyed the ambience, food and service. Bacon-wrapped shrimp was awesome & bartender did a great job on my cocktail. The food and service were awesome! Can’t wait to come back and dine again! Thank you for making my parents anniversary a special one!! Our waiter was excellent. The food was slightly warmer than room temperature. The food tasted very good. Wonderful people and great food! We started with the lobster wontons which were excellent, followed by salads, the Strawberry salad with Mandarin Oranges was outstanding, entrees of Salmon, Pork Chop smothered in cooked apples, and Braised Pork Shank, topped off by a very large Creme Brûlée. All paired with an excellent Nebbiolo from Alba, Italy. The evening meal and conversation with friends couldn’t have been any better. Awesome dining experience. Our waiter-John was superb. Very nice acknowledgement of our anniversary. Very Disappointed in the Ribeye Steak and veggies over cooked. I made these reservations for my husband's birthday. When we arrived, we were seated right away and I thought our evening was going to less than perfect. We were seated right next to a couple with a small child (6-8 months) who was not very happy to be there. After the first 15 minutes of listening to her scream, they finished their meal and left. Other than that little speed bump, the evening proceeded perfectly. Service was fantastic. The food was phenomenal. 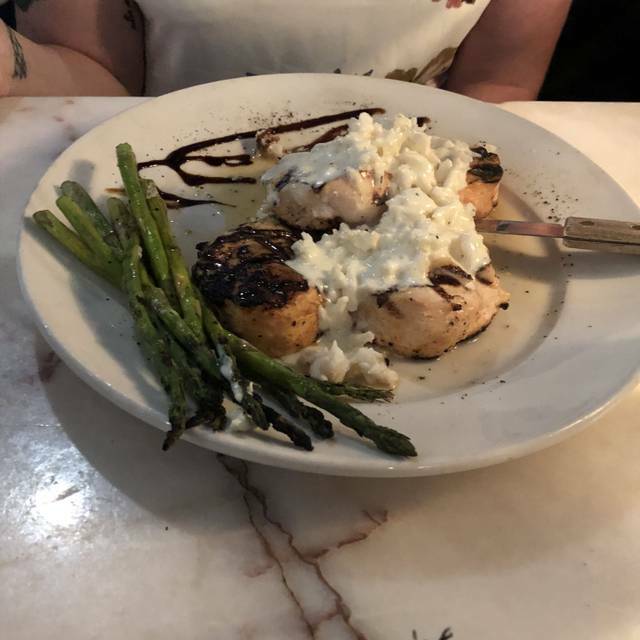 I had the balsamic pork chop and my husband had the filet. They were cooked perfectly. For dessert we had the key lime cheesecake and strawberry wontons. Again......phenomenal! I would definitely go back again.